This year I would like to nominate a blog in the edublog awards. 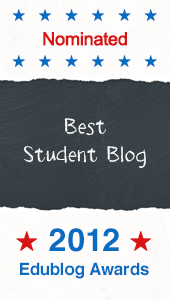 I want to nominate this student blog, in the category "best student blog", www.englishsandvika.wordpress.com , written by Hanne. She has a very good blog, with interesting posts, a good layout and she has got very many hits! I would also like to nominate a blog in the category "best teacher blog" : http://www.annmic.wordpress.com/ , written by my teacher, Ann. Hi, my name is Karoline! I am from Norway, and this is a blog for my english-class.